The ET-7000/PET-7000 ranges are web-based Ethernet I/O modules. They feature a built-in web server which allows configuration, I/O monitoring and I/O control by simply using a regular web browser. Remote control is as easy as surfing the Internet! The units also include a web HMI function which makes creating dynamic and attractive web pages for I/O monitoring and I/O control easy, with no programming or HTML skills required. Additionally, the ET-7000/PET-7000 modules also support Modbus/TCP protocol, which gives simple integration with a wide range of SCADA software including our own Orchestrator. The I/O Pairing Facility allows the value of the Digital or Analog input on the ET-7000 module to be copied (using ModbusTCP) to the Digital or Analog output register of another local I/O module. The PET-7000 features Power over Ethernet "PoE", so that not only data but also power is carried through an Ethernet cable. This feature makes installation of PET-7000 a piece of cake. Imagine no more unnecessary wires, only an Ethernet cable with a compatible Ethernet Switch (available from us) us all that is required. Ethernet-based DAQ device with 8 analog inputs, 250 kS/s sample rate, 2 analog outputs, one 32-bit counter input, and 8 digital I/O. Includes network cable, power adapter, and MCC DAQ software CD. Ethernet-based 24-bit, 8-channel thermocouple input device with 8 bit-configurable DIO lines. Includes, Ethernet cable, power supply, and MCC DAQ software CD. Functionally equivalent to the USB-TC. USB/Ethernet Based High Precision 32-channel Thermocouple Measurement Device. Supports up to 64 channels of Thermocouples with optional expansion unit. Each input also has an isolated Digital Output, which can be used for Alarms. 8 isolated Digital inputs are also provided. Ethernet-based DAQ device with eight analog inputs, 250 kS/s sample rate, two analog outputs, one 32-bit counter input, and 8 digital I/O; compatible with 8B analog modules and SSR digital modules. Includes an external power supply and accessory kit. Ethernet based Data Acquisition I/O module offering 3 Analog Inputs, 6 Digital/Counter Inputs plus 3 Relay Outputs. Has integrated Web Server with configurable HMI screens. It can also communicate with SCADA and other monitoring systems via use of ModBus TCP protocol. Ethernet based Data Acquisition I/O module offering 8 Thermistor Inputs plus 4 Digital Outputs. Has integrated Web Server with configurable HMI screens. It can also communicate with SCADA and other monitoring systems via use of ModBus TCP protocol. Ethernet based Data Acquisition I/O module offering 7 Analogue RTD Inputs for monitoring 2 or 3 wire devices. Has integrated Web Server with configurable HMI screens. It can also communicate with SCADA and other monitoring systems via use of ModBus TCP protocol. Ethernet based Data Acquisition I/O module offering 2 Strain Gauge Inputs, 1 Excitation Voltage Output, 2 Digital Inputs/Counters and 2 Digital Outputs. Has integrated Web Server with configurable HMI screens. It can also communicate with SCADA and other monitoring systems via use of ModBus TCP protocol. Ethernet based Data Acquisition I/O module offering 8 Analogue Inputs and 4 Digital Outputs. Has integrated Web Server with configurable HMI screens. It can also communicate with SCADA and other monitoring systems via use of ModBus TCP protocol. Ethernet based Data Acquisition I/O module offering 8 Analogue Inputs and 4 Digital Outputs. Has integrated Web Server with configurable HMI screens. It can also communicate with SCADA and other monitoring systems via use of ModBus TCP protocol. Power-over-Ethernet version. Ethernet based Data Acquisition I/O module offering 10 Differential or 20 Single-Ended Analog Inputs. Has integrated Web Server with configurable HMI screens. It can also communicate with SCADA and other monitoring systems via use of ModBus TCP protocol. Ethernet based Data Acquisition I/O module offering 10 Thermocouple Inputs plus 6 Digital Outputs. Has integrated Web Server with configurable HMI screens. It can also communicate with SCADA and other monitoring systems via use of ModBus TCP protocol. Ethernet based Data Acquisition I/O module offering 6 Analogue Inputs, 2 Analog Outputs, 2 Digital Inputs / Counters and 2 Digital Outputs. Has integrated Web Server with configurable HMI screens. It can also communicate with SCADA and other monitoring systems via use of ModBus TCP protocol. Power over Ethernet based Data Acquisition I/O module offering 6 Analogue Inputs, 2 Analog Outputs, 2 Digital Inputs / Counters and 2 Digital Outputs. Has integrated Web Server with configurable HMI screens. It can also communicate with SCADA and other monitoring systems via use of ModBus TCP protocol. Ethernet based Data Acquisition I/O module offering 12 Digital Inputs/Counters and 6 Digital Outputs. Has integrated Web Server with configurable HMI screens. It can also communicate with SCADA and other monitoring systems via use of ModBus TCP protocol. Ethernet based Data Acquisition I/O module offering 8 Digital Inputs/Counters and 8 Digital Outputs. Has integrated Web Server with configurable HMI screens. It can also communicate with SCADA and other monitoring systems via use of ModBus TCP protocol. Ethernet based Data Acquisition I/O module offering 16 Digital / Counter Inputs (Dry Contact). Has integrated Web Server with configurable HMI screens. It can also communicate with SCADA and other monitoring systems via use of ModBus TCP protocol. 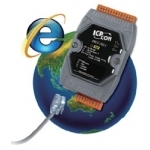 Ethernet based Data Acquisition I/O module offering 16 Digital / Counter Inputs (Dry Contact). Has integrated Web Server with configurable HMI screens. It can also communicate with SCADA and other monitoring systems via use of ModBus TCP protocol. Power-over-Ethernet version. Ethernet based Data Acquisition I/O module offering 6 Digital / Counter Inputs and 6 Power Relay Outputs. Has integrated Web Server with configurable HMI screens. It can also communicate with SCADA and other monitoring systems via use of ModBus TCP protocol. Ethernet based Data Acquisition I/O module offering 6 Digital / Counter Inputs and 6 Power Relay Outputs. Has integrated Web Server with configurable HMI screens. It can also communicate with SCADA and other monitoring systems via use of ModBus TCP protocol. Power-over-Ethernet version. Ethernet based Data Acquisition I/O module offering 8 Photo-MOS Relay Outputs. Has integrated Web Server with configurable HMI screens. It can also communicate with SCADA and other monitoring systems via use of ModBus TCP protocol. PM2.5, CO, Temperature and Relative Humidity Data Logger. Touch Screen display. RS485 communications. Standalone or use as part of a monitoring solution. Modbus RTU/TCP & MQTT Protocols supported. CO, Temperature and Relative Humidity Data Logger. Touch Screen display. PoE/Ethernet/RS485 communications. Standalone or use as part of a monitoring solution. Modbus Protocol supported. CO2, Temperature and Relative Humidity Data Logger. Touch Screen display. PoE/Ethernet/RS485 communications. Standalone or use as part of a monitoring solution. Modbus Protocol supported. CO2, Temperature and Relative Humidity Data Logger. Touch Screen display. PoE/Ethernet/RS485 communications. Standalone or use as part of a monitoring solution. Modbus Protocol supported. IP65 casing. CO, CO2, Temperature and Relative Humidity Data Logger. Touch Screen display. PoE/Ethernet/RS485 communications. Standalone or use as part of a monitoring solution. Modbus Protocol supported. Power over Ethernet based Data Acquisition I/O module offering 4 Analogue Inputs, 4 Analog Outputs and 4 Digital Inputs / Counters. Has integrated Web Server with configurable HMI screens. It can also communicate with SCADA and other monitoring systems via use of ModBus TCP protocol. Power over Ethernet based Data Acquisition I/O module offering 11 Power Relay Outputs. Has integrated Web Server with configurable HMI screens and integrated 2-port Ethernet Switch for Daisy-Chain Topology. It can also communicate with SCADA and other monitoring systems via use of ModBus TCP protocol. Tiny Ethernet Digital Input/Relay Output unit supporting 2 Wet Contact Inputs and 2 PhotoMOS Relay Outputs (1A). PoE. Tiny Ethernet Digital Input unit supporting 6 Wet Contact Inputs. PoE. Tiny Ethernet Digital Input unit supporting 6 Dry Contact Inputs. PoE. ModbusTCP I/O Expansion unit, supports up to 4off I-87k series plug-in modules. ModbusTCP I/O Expansion unit, supports up to 8off I-87k series plug-in modules.